It's the festival of lights! Light up the faces of your family and friends, with our delicious Hanukkah Candy bars. Fun, Festive, and trendy, our Chanukah Candy Bars and Candy Bar Wrappers are perfect for Hebrew School parties, Corporate parties, or to hand out to your loved ones. 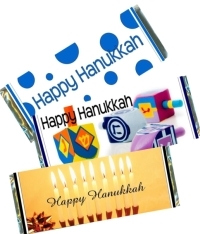 Whether you spell it Hanukkah, or Chanukah, either way our Candy Bar Wrappers will say it all! We can change any wording, color, even customize a Hanukkah candy bar wrapper for you FREE! If you would like a unique one of a kind Chanukah candy bar wrapper, just let us know and we can work with you to create a spectacular custom candy bar. There is no SWEETER way to say Happy Hanukkah, or Happy Chanukah, and Happy Holidays than with a delectable chocolate bar favor. Order the WRAPPERS ONLY. We provide the SILVER FOIL underlay and PERSONALIZED WRAPPERS! *This is for the do-it-yourselfer. We do NOT provide the Hershey candy bars!! *Our wrapper/foil combo will fit 1.55 oz "Regular" Size Hershey' bars! *Assembly is required by customer *To sum it up: YOU buy the chocolate bars, YOU wrap bar with silver foil provided then wrap with your personalized wrapper. Order the fully WRAPPED CANDY BARS. We will do the work for you! Your Holiday Party favors will arrive to you all ready to pass out to your guests. If you would like to use a "photo" design, or company logo, please send image & order number to info@candyundercover.com. Godiva candy bars $4.25 ea.